An international journal publishing high quality articles in all areas of science. In this technological world, every product is either completely or partially made up of polymer. Hence, fire hazard is the most common hazard of the modern world. To minimize the fire hazard, combustion processes are exhaustively studied. 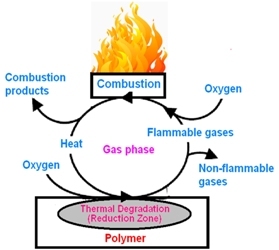 To suppress the combustion process, either condensed phase active or gas phase active or both active flame retardants compounds have been synthesized and commercialized. These flame retardants are broadly classified into two types based on the mode of incorporation of these materials into the polymeric systems or the flame retardants are specifically classified based on the chemical characteristics of the elements or the group responsible for the flame retardancy. Each type under chemical classification is vividly presented. The developed version of the flame retardancy is the intumescence. The formulations of various nitrogen- and phosphorus- based intumescent flame retardants have been discussed. The complicated mechanism of intumescence and the factors affecting the intumescence nature have been discussed. The phophorus based intumescent flame retardants are more in number than the nitrogen based. The compatibility of the phosphorus-based intumescent flame retardants with various polymers, their intumescent behaviour using in situ-FTIR, Raman spectroscopy, TGA, TDA, DSC, flash pyrolysis, EGA, Py-GC-MS techniques, various factors affecting the intumescent character, the mechanism of intumescent action studied by many researchers have been elaborately discussed. The effect of nanoparticles on the intumescent behavior is also mentioned. The thermal study of the polymers and intumescent flame rertardant loaded polymers is the basic key aspect for the development of intumescent flame retardant. Hence, the decomposition mechanism of the virgin and loaded polymers studied by various researchers is given in detail. The next important key aspect for the intumescent flame retardancy is the nature of the char formed. Hence, the studies on the morphology and fire insulation are presented explicity. Finally, various analytical tools like limiting oxygen index, UL-94 test, cone calorimeter test adopted by the researchers to test the flame retardant quality of the loaded polymers are discussed.